Marking Earth Day, Apple on Friday debuted a new TV commercial, using Siri to promote its custom-designed recycling robot —Liam —and its branding as an environmentally-responsible company. 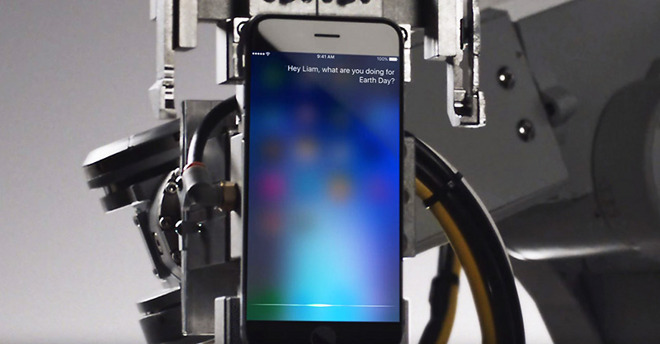 The 24-second spot shows Siri running on an iPhone held by a Liam unit. Siri asks the robot what it's doing for Earth Day, only to be "killed" once Liam starts stripping the iPhone apart. Apple has launched a multi-pronged marketing campaign for this year's Earth Day. These include the company's standard tactics, such as turning the leaf green on Apple Store logos, as well as unique approaches, such as a video claiming people are helping the environment by using iMessage. Liam was introduced at the company's March 21 press event, and was designed to strip iPhones and other devices into discrete parts, which in turn can be salvaged for recyclable materials. At the same time, the company can remove potentially hazardous chemicals. The robot is not yet believed to be in widespread use, and indeed much of Apple's e-waste recycling is non-Apple products handled by outside parties.